viewing, scenic views, and fishing at the Kasilof River and Johnson [and Tustumena] Lake . . .
photos highlight the homesteading days, fishing, trapping, and fox farming in the Kasilof area." Yay!!! We had some sun today! I got up at 6 AM to go to the bathroom and it still seemed cloudy so I went back to bed until 8. Jim got up about 7:15 and it was sunny. If I�d known that, I would have gotten up earlier! We still managed to pack in a lot of sightseeing today in the northwestern corner of the Kenai Peninsula -- so much that I'll divide it into three entries. the old buildings at the Kasilof Regional Historical Association's museum. It remained chilly all day, however, reaching only into the low to mid-50s F. in the afternoon. I found this article online re: Anchorage�s coldest early July on record and heard it on the local news tonight. It probably applies to the upper Kenai Peninsula as well. We know how to pick 'em, don't we?? The first time we visit Alaska is following the snowiest winter on record and then summer sets some new low-record temperatures! Know what? I'm enjoying the heck out of Alaska anyway. And it sure beats the current high heat wave in much of the Lower 48 states. We left the Kasilof RV Park about 9 AM for our day trip. You can see another fishing wheel on the opposite bank. 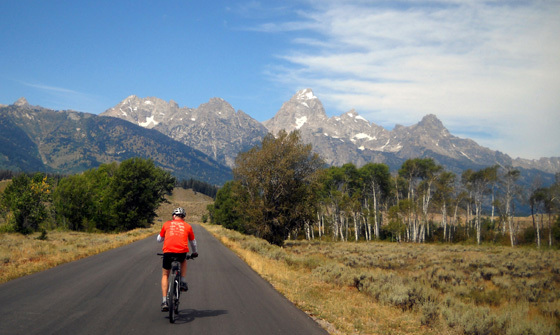 Both are operated by the nearby Johnson Lake State Recreation Area. Fish wheels have been used for many years in Alaska and are quite efficient at catching salmon. Note the pretty turquoise color of the river from glacial silt. The river flows about 15 miles to Cook Inlet from the outlet at Tustumena Lake, which is filled with water from Tustumena Glacier in the Kenai Mountain Range. 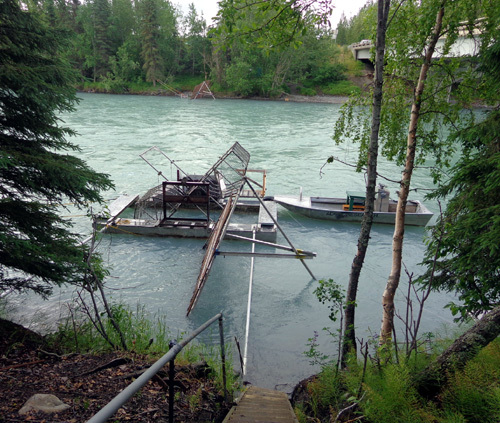 The Kasilof is another of many popular fishing rivers in Alaska. There are numerous lakes and streams in this state and they all seem to be popular fishing venues! 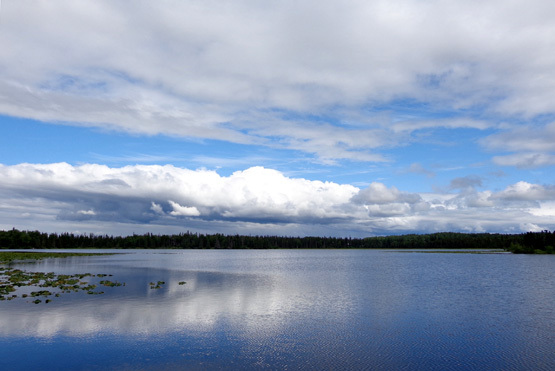 Tustumena Lake is the largest body of water on the Kenai Peninsula, measuring 25 miles long by up to six miles wide. The lake is notorious for periodic high, unexpected winds coming off the glacier and the Harding Icefield; boating is popular but very risky here. He didn't get as far as the big lake but he rode through the Johnson Lake SRA campground. 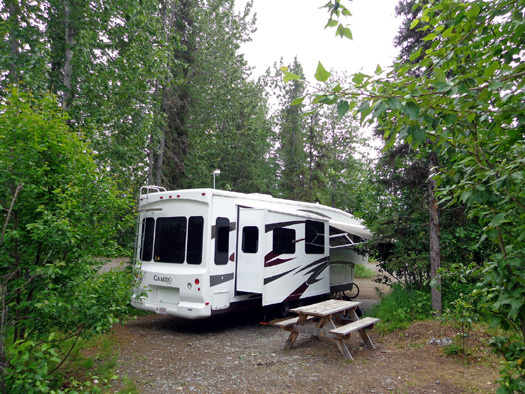 This public campground, which has about 50 sites, would also be a good base for day trips on the western side of the Kenai Peninsula area. 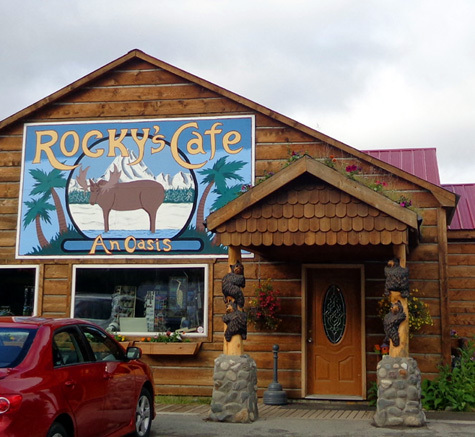 On our way to Soldotna and Kenai this morning we also stopped at Rocky's Cafe and the Kasilof Mercantile store. They sit on a hill along the Sterling Hwy. just above the Kasilof River. See the carved wooden bears climbing the posts? 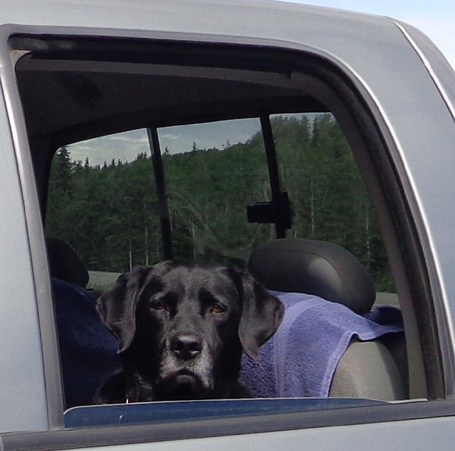 We continued on to the towns of Kenai, Nikiski, and Soldotna today. I'll talk about what we saw there in the next two entries. The remaining photos in this entry are from the Kasilof area, which we explored further just before arriving back at our campground near suppertime. It was a long but interesting day. 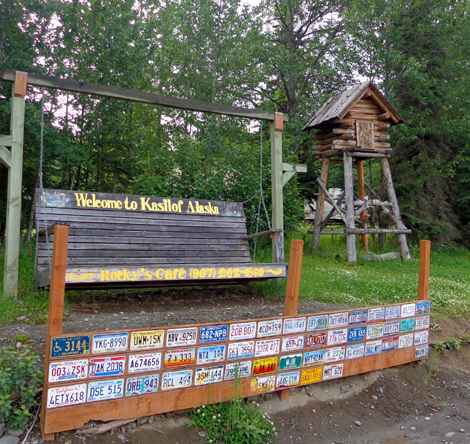 Modern-day Kasilof is a small town of only about 500 people. 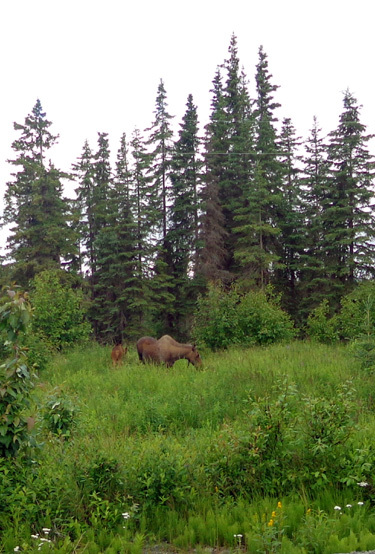 Like nearby Soldotna and Kenai, its population swells in the summer with both in- and out-of-state visitors who like to fish, canoe, view wildlife, and enjoy the outdoors. It's also a hub of activity in the winter. It's touted as a dog-mushing Mecca and home to the Tustumena 200 Sled Dog Race. Snowmachiners and cross-country skiers also enjoy many miles of snowy trails in the winter. It's an interesting place for history buffs, too. 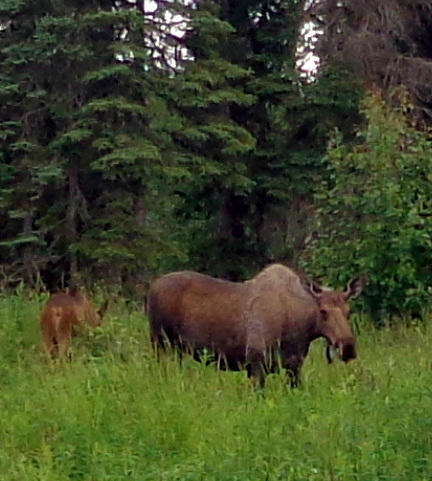 Near the intersection of the Sterling Hwy. 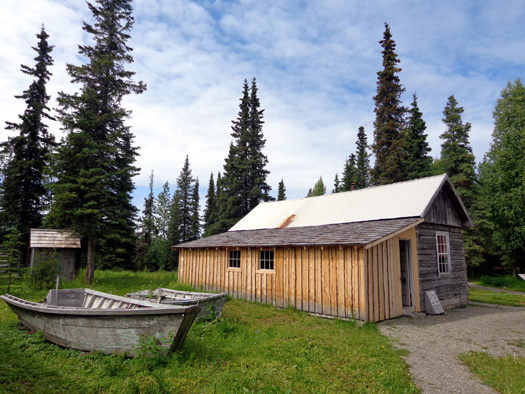 and Kalifornsky Beach Road is a collection of about ten log cabins and other buildings, some restored and some in the process, that have been moved to this location from different parts of the area to showcase life in the area from the late 1800s to the mid-1900s homesteading era. It is staffed by volunteers from the Kasilof Regional Historical Association. 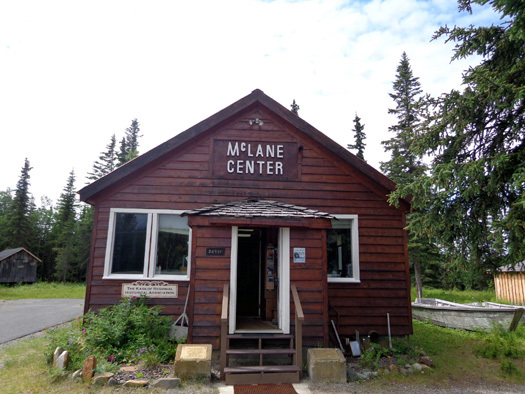 The museum is housed in the old McLane Building, a fish cannery hospital in the 1890s that was originally located at the mouth of the Kasilof River on Cook Inlet. 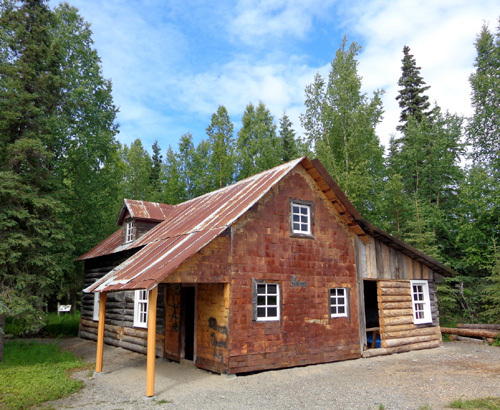 It was subsequently used for the Kasilof Terrirotial School from the 1930s to the 1950s. That's some good recycling, eh? This is its third useful life. An older male volunteer was busy talking to two other couples in this building, which had several displays of tools, photos, and other historical artifacts. When I went outside to take photos of the buildings he asked if I wanted a tour. I was in a hurry so I said I�d just like to look around. All but one of the buildings was open so I could peek inside. You can read more about the fox farms and local residents in this online Historical Assn. newsletter from January, 2008. Another of the resident's names mentioned in the newsletter is Victor Holms. 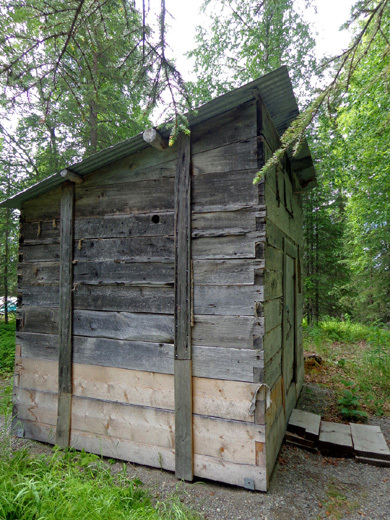 His simple trapper's cabin on the museum grounds has a sign with some interesting historical notes. In the winter Holm made his living trapping fur-bearing animals. 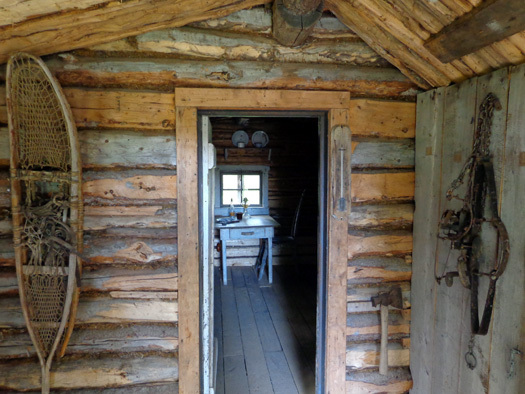 He built the cabin shown above about five miles upstream from his home to use as a base in the winter months. A sign explains how it was built. Small cabins like this were built all over the peninsula and were often used by a succession of trappers. 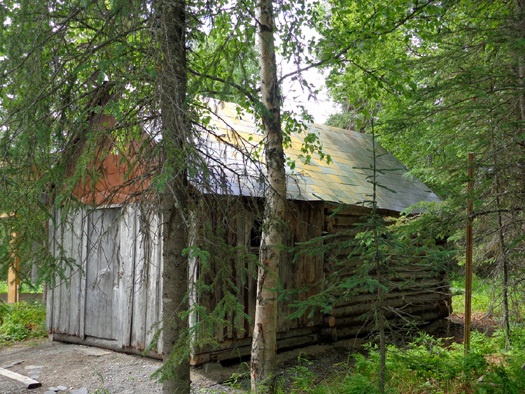 This unlocked cabin on the river became a shelter for travelers going to and from Tustumena Lake to hunt and trap. It was common for people to write messages in notebooks left in the cabins, which reminds me of the notebooks in shelters along the Appalachian Trail -- same concept. 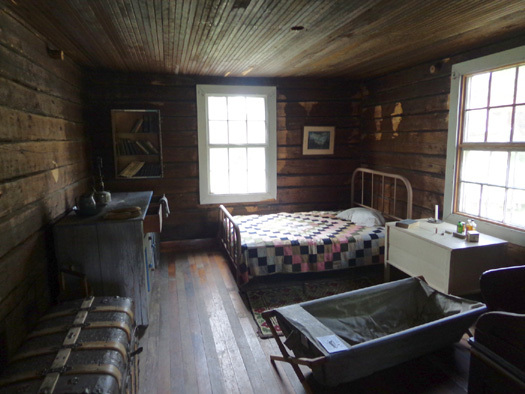 In this cabin there are still several penciled notes left on the walls between 1914 and 1917. 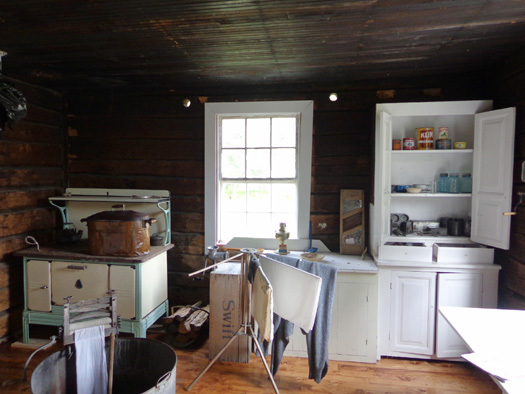 This cabin was used until the 1950s. It was donated to the Historical Association in 2006, moved to this location, and restored. 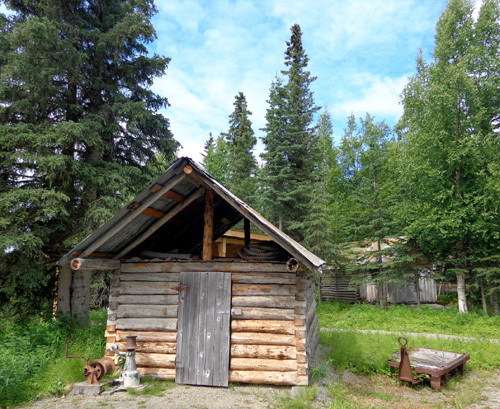 This one was built by Abe Erikson, owner of the fox farm, in the 1920s on the bank of the Kasilof River. It was strategically located above the rapids near Tustumena Lake in a slow-moving section of the river called "slackwater." Hunters and trappers used the shelter for many decades as they traveled by boat to and from the lake. This cabin is unusual in that it is not constructed of logs but spruce lumber salvaged from fish traps along Cook Inlet. Winter ice in the inlet would destroy the traps so they were taken apart after every fishing season. The big milled timbers were not reused by the canneries so local residents recycled the planks for their own use. 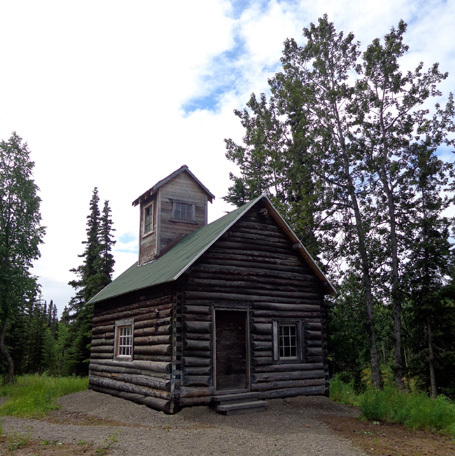 In 2008 the Kenai National Wildlife Refuge donated the cabin to the Kasilof Historical Association and it was moved to this location. I don't know the historical significance of that one but you can read a little more about it in the March, 2009 KRHA newsletter online. We recommend visiting this place. It's a work in progress as more buildings are moved to the site and volunteers restore them to their original condition. Admission to the museum and grounds is free, although donations are gladly accepted to further the Historical Association's endeavors to preserve local history.